Encompass both your sadness and happiness. Hands of people are ever-present with kindness. Affirms, philosopher; Francis Bacon with ease. Known as golden rule; so popular and beautiful. For the Bible says man’s heart is deceitful. Let introspection alone prevail therefore. Here poet is explaining about people being active support of an idea or cause especially the act of pleading or arguing for something in the perfect creation. Giving us pitiful and felicitous it depends on our own understanding of incineration or fiction for this some people will be present at the end with benignity. But we are searching to gain peace all over and everywhere it will be toilsome. It is Allay and assure by Francis Bacon. 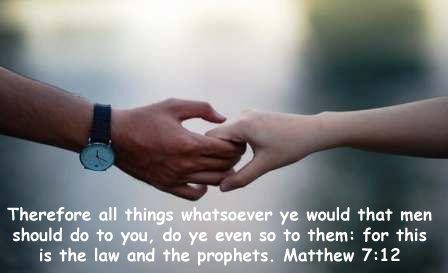 To get into the heaven we need to read, understand and follow Matthew 7:12. Because it is a very prosperous, famous and lovely formula. In the Church it it taught by many Pastor's and preachers but follow very less people. And why like this happening because Bible itself says that man is double-dealing with all the things. Here in the worldly life we can by anything but there is no manufacturer produces peace so we can not buy it at any shop. We individually has to try and search inside our heart and mind. Peace of mind and serenity will be there eternally. So let us do self-contemplation and predominate exclusively to get the Salvation and Peace.